Wow. That's a lot of hexies!! I've quilted through 3 layers of batting plus fabric and survived to tell the tale. I never change my needle! Shocking I know but I only ever replace it if it breaks :) Ain't broke don't fix it...my motto for most things! 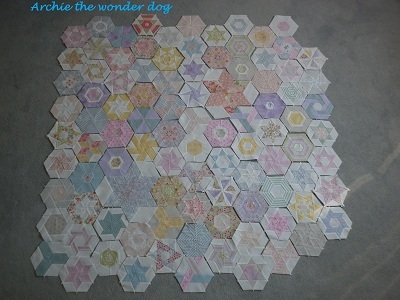 I'm clapping my hands here for you - wonderful job on these hexies! such wonderful design work. I so know what you mean about standing on the steps and leaning over to get a photo - I have to stand on top of a chair and stretch my arms up to hold the camera over the quilt to get a photo. Wow - Archie looks super dooper handsome in that first image. Amyways, your hexies are lovely and pale and lovely and can`t possibly assist on the sashing issue. Can`t wait to see you get out of the taxi at the Stained (ewwww) party! Oh Helen, your hexies look so awesome! And Archie is soo cute again! Love your hexies. 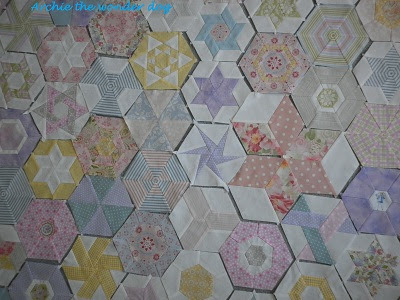 I know nothing about the intricacies of piecing them, but I like the wayvtheyblook all together soni vote no sashing between, I think non-pieced hexies to make the awkward ones work better would be the preferable solution. Remember Stained first, cleaning only if you can muster the strength. Priorities after all! Good luck with the conservatory - do you save dead bugs on the blinds like we do!? Love your hexies, they look absolutely amazing! Wow 101 already and your aiming for 202! You're crazy, but brave...throw in a few more unpieced hexies....maybe a bit more green? Wow-ee and whoop-dee-do! 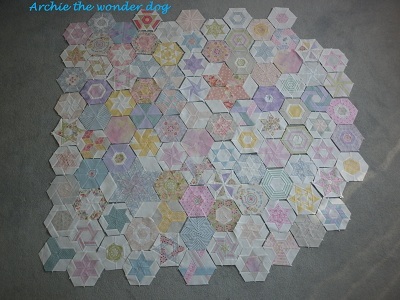 absolutely beautiful hexies Helen! I love all the different ones - are they all on flickr as I'd like to see individual photos of those smartypants ones! 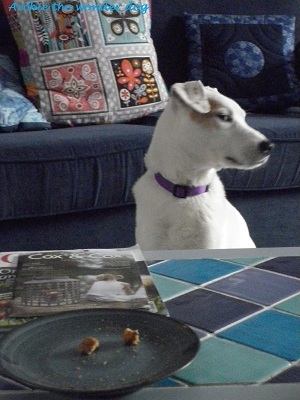 I love the way Archie is looking away but his eye is still on you or the toast! He is such an actor - he deserves a doggie Oscar! Wow!!! that is a lot of hexies in one pile. Nice work Helen...they look fantastic laid out. 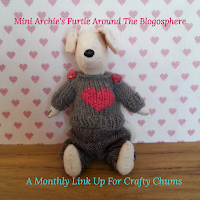 Archie's ears are so expressive and I love how his purple collar co-ordinates with your decor. Your hexies are a Tour de force...so methodically pieced and beautiful... but I see a stray orange up the top that looks like a hazard symbol...and waaaa it irks me. Sorry. The other colours are so delicate. Congratulations... half way there! Get Samantha from Bewitched to wriggle her nose at your conservatory! I LOVE Archie! What a great looking dog who lives up to his great name! And your hexes are spectacularly overwhelming! Amazing! Your hexies are spectacular! And so is Archie! My own hexalong project from last summer is in a basket near the sofa...I'll return to her some day, but there are so many other projects calling my name. What to do??? I reassure myself that these projects are not biodegradable: they will be there when I have the time and motivation to return to them. In the meantime, it's wonderful to see projects like yours progressing so beautifully! It's going to be a stunning quilt. Your hexies look wonderful! The colours make me think of summer. Just glorious!! Baxter is somewhat like that with food as well. Funny how they think that staring at us piteously will work -- or perhaps they really do know how to get what they want! Your hexies are so adoreable! And I admire your patience with them! EPIC!! They look very beautiful nested together, but I try to imagine what they look like with a sashing between--*no* idea how you would do that--wonder if it would give each hexie chance to shine? Although they look good as they are. Also, I agree with a little more green. Glad to see Archie looking bright-eyed! I was going to say to use a little less white, but if you are running out, maybe it's ok anyway. I'm not a fan of sashing, I didnt use any on my quilt, you have alot of head scratching coming up, have fun!! Only 1153?? What a slacker! 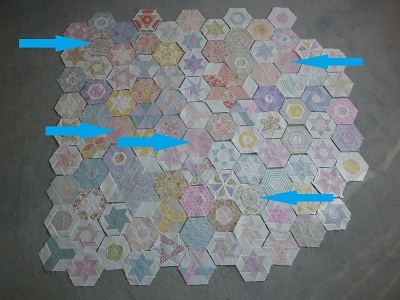 I never considered sashing my hexies, I loved the eclectic look of all the different styles playing together and used a lot of plain ones to pad them out. Didn't seem to have a problem with seams when I joined, probably battered them into submission, but they were a bit bothersome round the edges when I added borders. Your hexies are beautiful and I look forward to more pics when the sun shines - young Archie is looking pretty perky too. Your hexies are beautiful!! Do take it easy with the cleaning, we want to hear from you sooner rather than later! Have fun with the Stained blocks and see ya soon. Stunning, wow this is going to be one fabulous quilt. 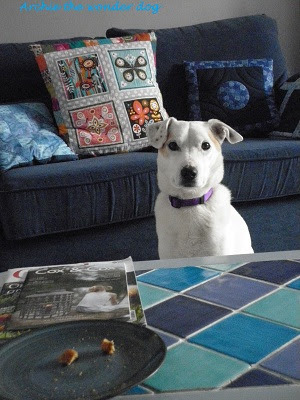 Archie so reminds me of Sam, he sits and waits for any milk left from my cereal, he use to get bits of toast or bread as well but he has put so much weight on he is now on a diet..... you can well imagine his face when he doesn't get anything!!!! I wouldn't worry about the way the seams go. You're hand sewing these right? You can just move the seam the way you want it as you put them together. That's what I do. But then, I don't press them until they're all together so it's easier that way. I just finger press them as I'm going. rockin awesome. 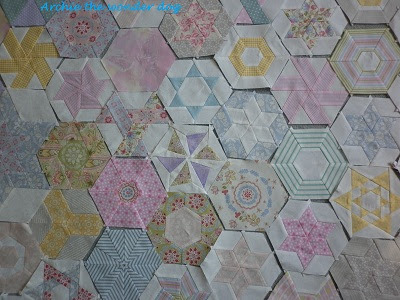 that will be one beautiful quilt, i think the whole piece hexies blend wonderfully. go you. Oh I love your pics of Archie, he always looks so fab. And your hexies look amazing, thats some serious work you have done there! I'm completely amazed and impressed with your hexies. Wow! 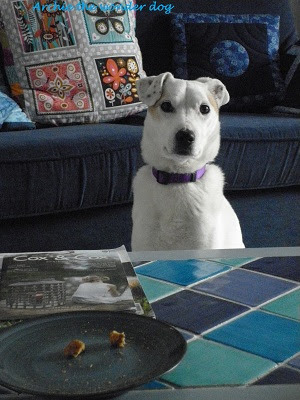 Wow your hexies look fantastic as does Archie...by the way he never took is eye off the toast, he was trying to trick you haha....if Slip doesn't get my crusts straight away I get the paw on the leg routine to remind el thicko (me) that I've forgot! Your hexies look wonderful! I do think you have a good balance of color :) I love the pictures of Archie. I love your hexies - the quilt is going to be wonderful. I recommend a topstitch 90/14 needle. 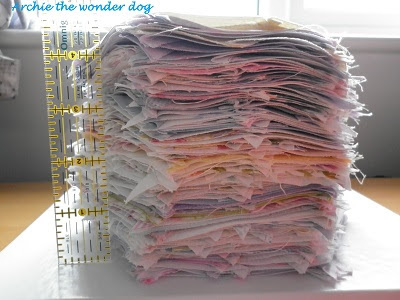 I have never tried to double the wadding, I would test it first on a sample before I basted the whole thing to make sure it works. You could always make her a second quilt instead, to make it heavier, just saying. Each of your hexies is a work of art - I'm very impressed with you! And Archie too - he' so cute! Good grief, I've never seen so many hexies! I feel drained looking at how many you've created so far - I bow to your superior hexie ability! Love love love the hexies!! The hexes look fantastic just as they are, what a beautiful quilt this will be. those hexies are unbelievable!! you are a rock star in my book, Helen. Wow, I am so impressed... your hexies are beautiful and quite an accomplishment. You are awesome! Bravo! I'm late, but have been meaning to say that your hexies look fabulous. I haven't worked on mine since last summer. Time to dig them out ... there perfect for summer piecing in the garden.